This topic contains 3 replies, has 1 voice, and was last updated by Nadeem Yousaf 6 years, 8 months ago. Leadership is one the most interesting and crucial topic in organizations. It has many facets, which people like to discuss and improve their leadership skills. Leadership means showing behavior and directing people to achieve goals and objectives which are beneficial for whole community and for an individual. The role of leadership is to providing mission and vision to its acolytes and showing behaviors that are helpful in achieving the end-goals. 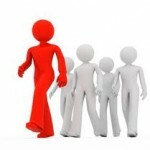 The concept of leadership does not only refer to people who are sitting at the top level, rather many people acquire this position in organizations; the only difference is number of followers. Only a few people have ‘God gifted’ traits of leadership, who are generally known as charismatic leaders. However, organizations do not rely on those few ‘God gifted’ leaders instead they look for people who have ability to learn skills of leading. Studies are agreed that leadership behavior can be learnt. Leadership skills people learn through deliberate and conscious efforts. Some of the skills that leaders must learn are communication, honesty (with people and mission), delegating power to right people, unbiased attitude and behavior towards the team of followers, willingness to take risk and responsibility of actions, providing guidance under pressure and so on. People look towards leaders at the time of crises and leaders must come up to this expectation. By learning and accepting the above characteristics of leadership, one can gain trust of one’s followers. There is of course difference between manager and leader. Managers generally think in short term and are mainly concerned about how and when to implement plans. They manage day-to-day business and focus upon improving existing products and process. They supervise and draw legitimate authority from their position. On the contrary, leaders think in about long term gains and know their customers’ need and requirement, not only of existing customers but potential customers. Thus they concentrate on introducing new products and processes to satisfy internal and external customers. They have the capacity to change mindset and behavior of their followers for which they rely on power sources such as referent power and expert power. All leaders can be successful managers but all managers cannot be leaders. Poor managers are those who mostly rely on coercive power to get work done. To be a leader, manager must understand needs and requirement of their followers and reward them whenever it is required. Managers and leaders can be differentiated on the dimensions of single-loop learner and double-loop learner. Single-loop learning refers to adjustment within the existing system. According to Argyris, it acts like a thermostat which only adjusts the temperature. He further says, using the analogy of thermostat, that double-loop learning means when thermostat asks as to why it is set at certain degrees. According to Argyris, highly skilled professional managers are very good at single-loop learning. They are scared of failure so they always do the ‘right things’ without showing the courage of taking unique and new initiatives. They are not trained to find ‘out of the box’ solutions. On the contrary, leaders go for unique and innovative solutions to the problems and source of binging change in the system.